Not quite as big as Hop Stoopid, but bigger than their IPA, Maximus is Lagunitas' "small" Double IPA. Apparently, it's a similar recipe to the IPA, but with "more hops, more alcohol and more body." Unfortunately, Lagunitas doesn't disclose the hop or malt varieties employed, but I think it's safe to assume there are hops in here that start with the letter "C."
Hmmm, alright. Well, let's pour this bad boy out and "ride the pint." Appearance: A crystal-clear clear, orange-brown body. On top, a finger of fluffy, off-white head that leaves good lacing. Aroma: A complex hop profile that's hard to pin down: perfumey, floral, earthy, piney, and candied citrus. Underneath it all, a solid dose of caramel malt. Taste: Much the same combination here: pungent, earthy, and citrusy hops over caramel malt. While the hop character is certainly not as big as you'd expect with the name and marketing, it's still very tasty. With everything going on, the alcohol is masked well. The aftertaste is nicely bitter. Mouthfeel: Medium-full bodied and almost creamy. Somewhat dry. Drinkability: With a milder hop profile and alcohol content, this is above average for the style. 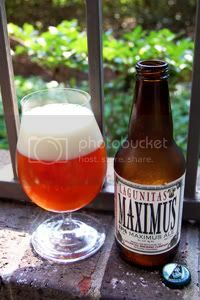 Verdict: Despite it's name, Maximus is certainly on the lower end of the Double IPA intensity scale. If you like pungent hops in your beer, this is certainly worth trying; just don't expect a total hop-bomb.